NanoHybrids results in brief. Copyright: TUHH. Today, April 11, 2019, the final results of 42 months research and innovation on novel organic and hybrid aerogel particle production will be presented at PARTEC 2019. A whole session “NanoHybrids” is devoted to disseminate the scientific achievements. The session covers relevant aspects related to the realisation of industrial production of a class of novel materials. Pavel Gurikov, junior professor at the coordinator TUHH, will start the session with a lecture on the state of the art and recent advances on aerogel particles. He will talk about the multistep production process with a focus on emulsion gelation and will present a comprehensive comparison of available methods in terms of particle size, throughput, energy input and integrability. Aerogel particles are desirable for many applications. The duration of the solvent exchange and supercritical drying is much shorter than that of monoliths allowing for a remarkable reduction of the process costs. The lecture will be followed by two presentations on modeling. Işik Sena Akgün, Koç University will talk about the kinetics of supercritical drying for production of aerogel particles and the effects of process parameters and gel properties and Natalia Menshutina, MUCTR, will present the multiscale modeling of particles supercritical drying process. This modeling approaches support design and optimization of industrial scale supercritical drying units. The multiscale approach includes modeling at three levels. The first level generates the internal porous structure of the dried material and the second level investigates the diffusion of the solvent through the pores, adsorption and desorption. Cellular automata models and the CFD method were used. The fourth lecture will concentrate on the drying of aerogel particles and beads in lab and in pilot scale. Main contributors to this presentation come from BASF and TUHH. 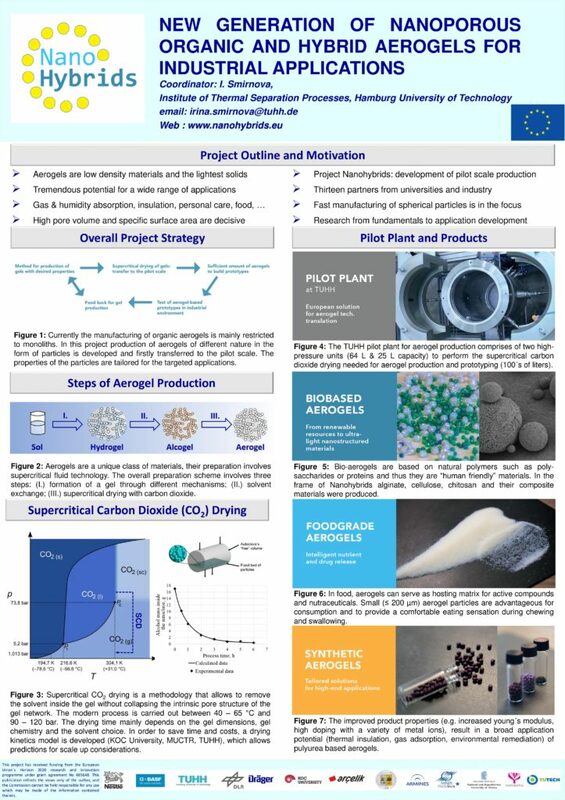 The drying of the aerogels in pilot scale forms a main step towards industrial production of aerogel particles and beads and has only become possible by research and development of the NanoHybrids project. Different strategies for the solvent extraction from hydrogel particles of different origins are investigated on bench and pilot scales. In particular, practical aspects of the solvent exchange and supercritical drying at larger scale are discussed. The second half of the lectures focus on specific novel aerogel classes and their application potential. Tatiana Budtova, MINES ParisTech, focuses on the production of cellulose aerogel beads via emulsion technique which can be used as drug delivery systems, e.g.. Lennart Salmen, RISE Bioeconomy (former Innventia) focuses on the potential of cellulose-hybrid aero/xerogels for sorption of gas, moisture and cationic compounds. Utilising the jet-cutter technique the production of regular, small gel particles in large quantities is possible. Kathirvel Ganesan, DLR, also presents results on bio-based aerogels. His lecture centres around chitosan-based aerogel particles. Their production from lab to pilot scale was developed in the DLR laboratory using JetCutter technique. With their versatile properties, after chemically modifying their functional groups, they can be used as applied materials in environmental control systems. Carbon-based aerogels for adsorption of toxic gases and air decontamination are presented by Patrina Paraskevopolouy, NKUA. They are derived from hybrid aerogels synthesized via new chemistry. Novel highly porous, high surface area carbon aerogels from pyrolysis and etching of organic (co)polymers (synthetic polymers, bio-polymers, polymeric waste, etc.) are described. The materials have been prepared in the form of powders, granules, spheres, pellets or monoliths. Aerogels are low-density highly porous nanostructured solids. Aerogels possess a set of unique properties such as low thermal conductivities, high acoustic attenuation, large specific surface area and pore volume. Further, they can host functional guests with useful chemical, electrical, magnetic or optical properties making them attractive for a broad gamut of applications . Aerogels are produced in a multistep process that involves gelation in a mold, solvent exchange and supercritical drying. This process results in monolithic aerogels. Many applications such as adsorption (gas and humidity filters), personal care (cosmetics) and food (functional foodstuffs) require however aerogels as particles of a specific size. Furthermore, the production of particulate aerogels has a tremendous advantage: duration of the solvent exchange and supercritical drying is much shorter than that of monoliths allowing for a remarkable reduction of the process costs. 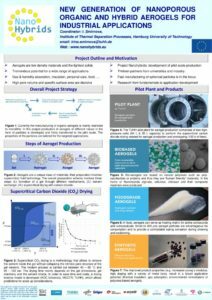 The NanoHybrids team achieved the production of large amounts of biobased and hybrid aerogel particles. A major step beyond the current state of the art towards industrial production has been done.